I've been quite neglectful of my blog and emails these past few days because we've been busy canning! Last week, I was talking to Trina from Retro Fashion is my Passion about how I've been wanting to build a little pantry full of home canned foods. She gardens and cans her own and says that it's easy and really fun. We went to our local farmer's market for cheap, beautiful produce. We bought some exquisite home grown tomatoes, a huge watermelon, cucumbers fresh off the vine, pale yellow bell peppers and a few lovely peaches and boxes of strawberries. 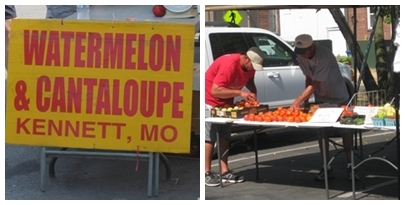 The Farmer's Market is in the historic district, right next to the Missouri River. It took 7 hours of peeling, dicing, roasting, boiling and canning but by the end of the day yesterday, we had peach preserves, strawberry jam, fire roasted tomatoes, fire roasted peppers and bread and butter pickles. Today, we're making watermelon pickles, which I have never had before. They are made using the peeled watermelon rind with just a hint of pink flesh left on the rind. They had to soak in the brine overnight so we'll be boiling and preserving them today. Trina has me totally hooked on canning now! We're making some sauerkraut and green beans next week and I'm even considering making some sloppy joe and spaghetti with meat sauce. I'm a little terrified of canning meat. It doesn't seem like it would last but people have been doing it for ages so I'm going to try it. I have a new respect for old-fashioned housewives and farm ladies. Canning is a whole lot of work but wow, it is SO worth it!! For our outing, I decided to try a 30's inspired look. It was 107F on the day we went out so I wore this light cotton dress and hair in a snood for comfort. I thrifted this vintage black handbag the day before. Since I was doing black accessories, I wore my 30's black celluloid brooch, which is one of my favorites. The 30's had such interesting lines in their jewelry. I did some last minute (wonky) waves. They turned out less-than-perfect to say the least, so I covered the silliness with this vintage straw hat, trimmed in pearls. And the dress is GORGEOUS! I love the look. Classic. What a shame that "the style" can't be more stylish. Anything from the 1800 up to 1950's. Where did we go wrong with today's fashion? Glad I stumbled upon your blog. I have that same pattern in my etsy wishlist cause I thought it looked so 30's. Great hat, btw! What a cute dress! You are so brave to go out looking fabulous in 107 degree weather! Way to go on the canning. When you get your house you can get a freezer chest and then all the meat you want to can you can just throw in the freezer. I actually like some things frozen over canned, like fruit. I've canned peaches and I like the taste of frozen better, they stay crispier too. We also freeze all our strawberries and blue berries too. Sometimes it's so much easier to freeze things than can. You can freeze loaves of zucchini bread for about a year, we just ate our last one from last summer! What lovely jars of canned goodies.. Know you will enjoy them.. I love to can too. But soooooooo agree, it is totally alot of work..
My daughter and I went to the farmers market this week and bought purple hull peas and put them up. SO yummy this winter. I agree canning is a lot of work, but it is so worth it. I will never buy jam from a store again! You definitely need two people though. Love your outfit! Way to go not dressing down in that weather! My mother always grows and cans her own green beans. I just hate the taste of store bought cans now. I never thought of going to the store and buying the beans to can. That is a great idea until next year when I will be planting my own vegetable and herb garden! Thank you everyone! Yes, I can't wait for next year when we can grow our own but in the mean time, I'm taking full advantage of seasonal prices at the produce stands and farmer's markets!! Luckily, Pj was home to help me. I really don't think I could have done it without him! It is certainly a two person job...if not more! Will you eat all that stuff? My husband loves making marmalade, but we always end up giving half of it away as we so rarely eat it. Don't you love how when it's blistering hot outside, a 30's do, is the best option? Fingerwaves, hair pinned under in a faux bob, and out the door, heat be dammed! Super cute! There's just something about homemade jelly that reminds me of the best of summer. You've inspired me. One would never know that it was a staggeringly toasty 107 degrees, as you look just as lovely and un-melted (not a word, I know ;D) as though it were a balmy 75. Fantastic look, the 30s suit you well, sweet gal! Oh, girl, be careful with the green beans. They are a low acid vegetable and need pressure cooked. Tomatoes and fruit are high acid and do just fine with a water bath. I have canned venison, carp, mushrooms, blah-de-blah. I am sure you have done your homework, just remember that botulism in an anaerobic organism and will go wild in a perfectly sealed, but improperly canned food. Auntie used to send me beans in re-used jelly jars, water bathed. I called them Danger Beans, and wouldn't touch them with a ten foot pole. You absolutely need a pressure canner to can anything with meat. It is unsafe to do it any other way. Even spaghetti sauce and tomato products (except whole tomatoes) need a pressure canner. You can can green beans if you pickle them- google some recipes for "dilly beans" and you can do it that way. Oh, I love canning! I've been doing jams and jellies thus far - grape, strawberry, blueberry, blackberry and most recently peach jam. I also still have a few jars of pepper jelly and pear honey that I canned last year. My next canning project will be pickling hot peppers! The canned meat was OK, kinda bland, but perfectly acceptable for soups, chili, etc. BUT the carp! My God, it was divine. I made the best "salmon" patties you ever ate. Carp is sweet and white, but you have to pressure forever..One time I stayed up all night canning corn. My brother came bumbling through the kitchen on the last load...nine quart jars of corn. Thatsa LOT of cutting and prep work. Anyway, he flipped the pressure weight just to hear the SSSSSSS of the pressure letting off. I heard Ping! Ping! Ping! (repeat nine times) as all of the bottoms of the jars broke inside the cooker. The stench of burning corn filled the air, my heart broke and I condemned my brother to everlasting...well, you understand. Get a new cooker, Brittany. You might find an old one, however and take a chance. Take it down to the extension office and have the gauge checked. If I had all night I could tell you family horror stories about canning cataclysms. Be careful. Carp?! I woudl have never thought of canning it! My mom makes salmon patties and they are to die for. I can't believe you lost all of that corn! I would have been heartbroken too. Everything I'm learning is from my grandma or my 50's canning book and they both told me to get my canner gauge checked every year just in case. My husband said we could probably find a used canner cause they 'aint cheap but I don't they're worth the risk! Oh, I dunno..I bought an old Universal canner from the '40's? maybe? It had honest to goshen LUG bolts all around the lid. You screwed them down and brought it up to pressure. Someone back in the day filled the old pop off valve with SOLDER. A more dangerous contraption...I cannot think of an appropriate parallel. However....I used the book, had the gauge checked, watched my pressure and lived to tell the tale. The problem with old canners is finding the rubber gasket that fits under the lid. Hey, if you get into a pickle(har) email me and I'll give you my phone number and you can call for free advise. A pickle! HAHAHAA!! Oh that thing sounds scary, you're a brave lady. Any experience with dehydrating? I have a food dehydrator that I've only ever used for banana and apple chips but I was thinking of drying some veggies and making some soup mixes to keep on hand. Well, I used to date a rather eccentric fellow that had an immense garden full of heirloom tomatoes. It got to be too much of a good thing. Sooo...we cut them up (without peeling) into slices and dehydrated GOBS of tomatoes. Night and day, day and night, the house smelled of tomatoes. Then I layered them in large Mason jars and covered them with good quality oil. Not olive, because, after all, I am no millionaire. Anyhoo, all this work resulted in delicious, delicious dried tomatoes. They were leathery, and very tasty. You could eat them right out of the jar, or cook them into a sauce, pop them into stew, whatever. I kept the jars in the door of the fridge and they lasted forever. You look gorgeous in these photos! I have never canned, wouldn't really know where to start.